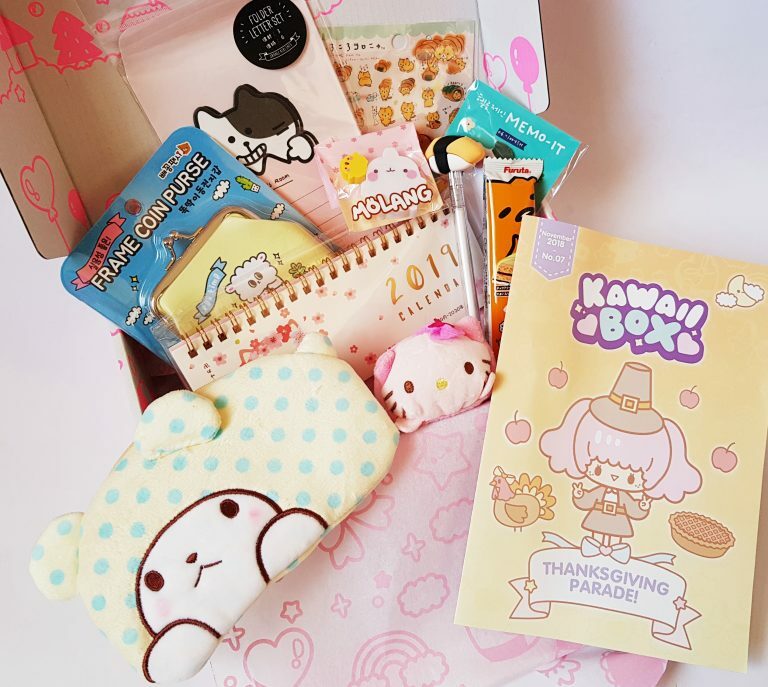 Kawaii Box is a monthly subscription box full of 10 – 12 cute kawaii items from Korean and Japan. It is the sister box of the Japan Candy Box, and costs around £15 per month. 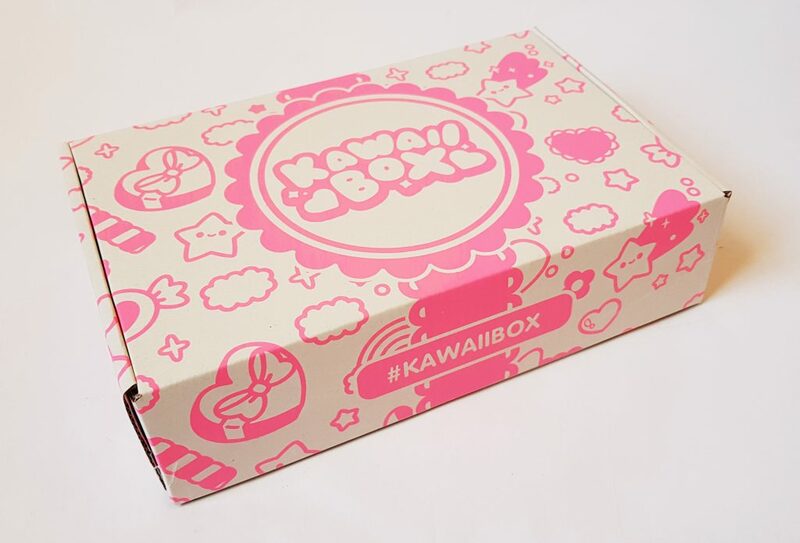 Even the box is kawaii! Such a cute design. Everything is wrapped in matching tissue paper. 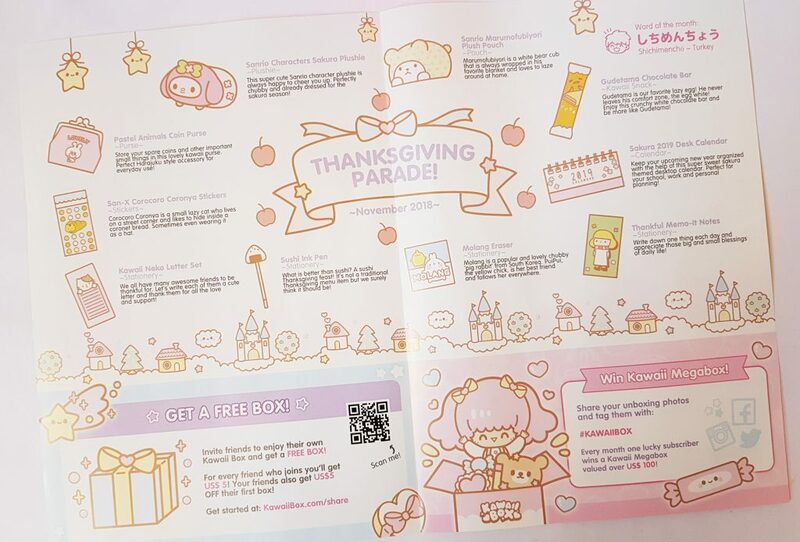 This month’s theme is Thanksgiving Parade! 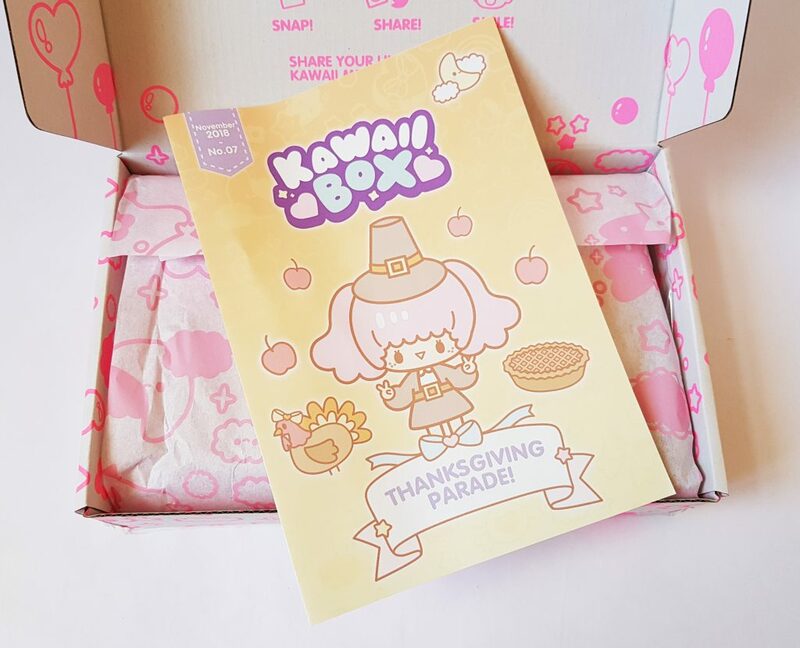 It ties in nicely with this month’s Thanksgiving Feast Japan Candy Box. Inside is a list and descriptions of all the items inside. This is a Sanrio Hello Kitty Mini Plushie. Soft and squishy, and she’s looking forward to sakura season with those little pink blossoms. 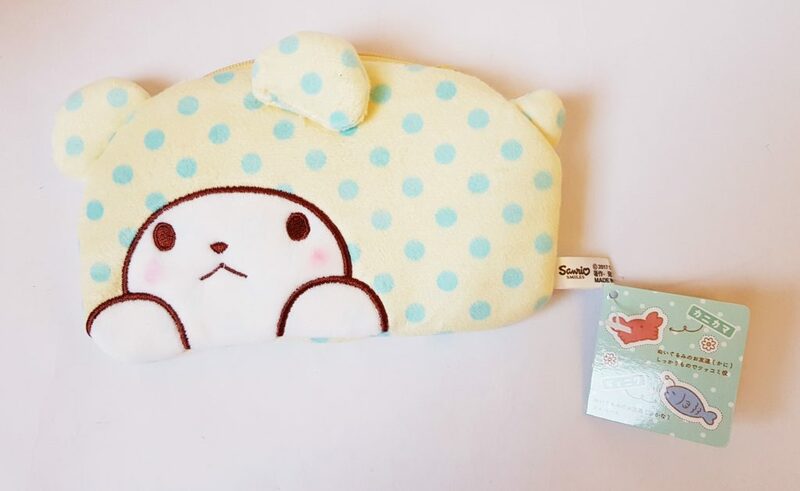 Another Sanrio item, a Marumofubiyoru Plush Pouch. This little blanket-wrapped white bear cub has a zip on top to keep change or other little things. Even snacks can be kawaii! 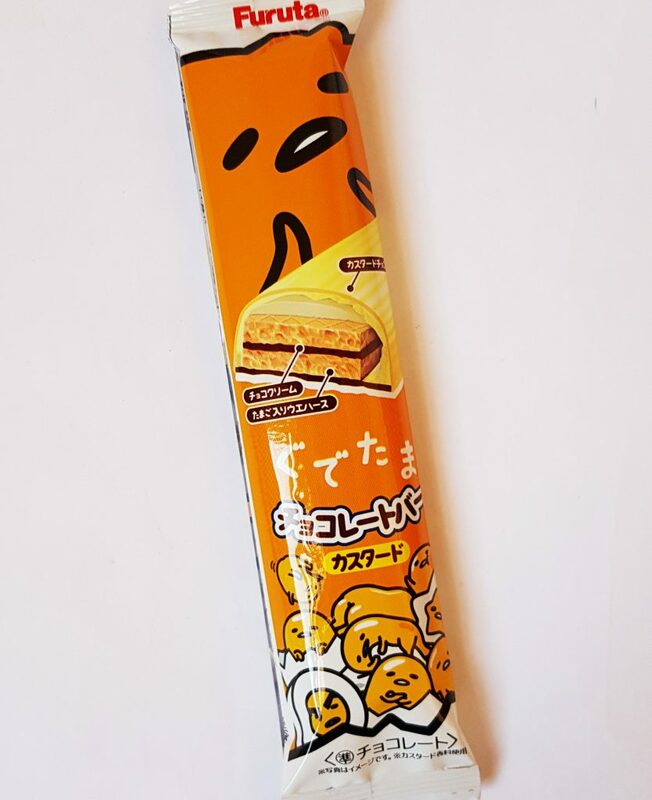 This is a Gudetama Chocolate Bar, wafer wrapped in white chocolate. Yum! 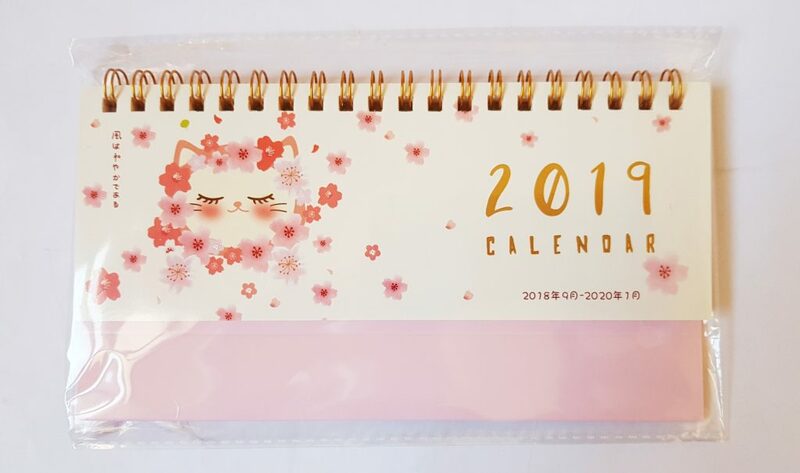 Here’s something useful for next year, a Sakura 2019 Desk Calendar. 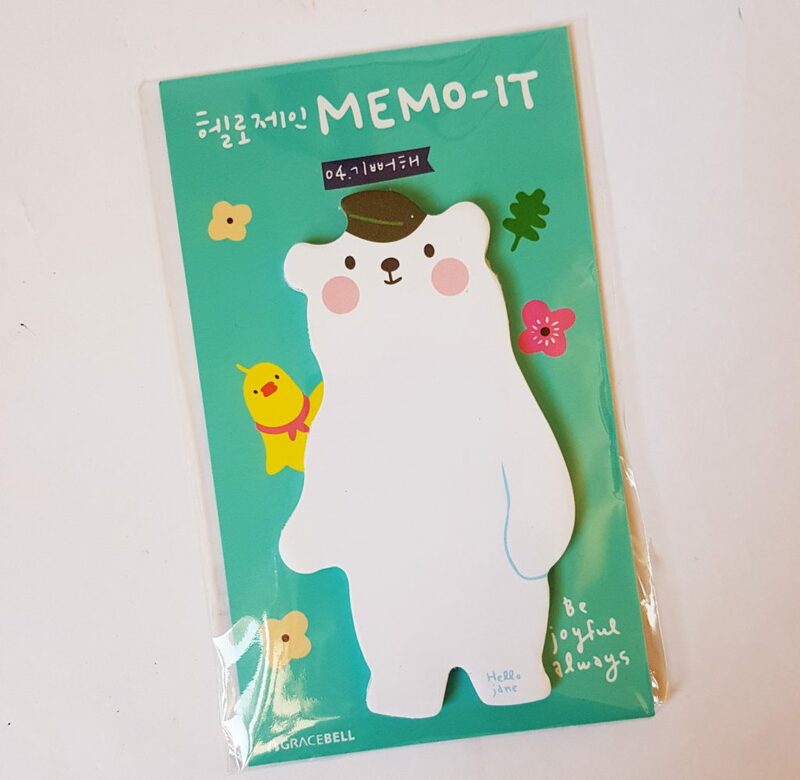 This cute little bear is a set of Thankful Memo-It Notes, and you can use them to write down something you are thankful for every day. 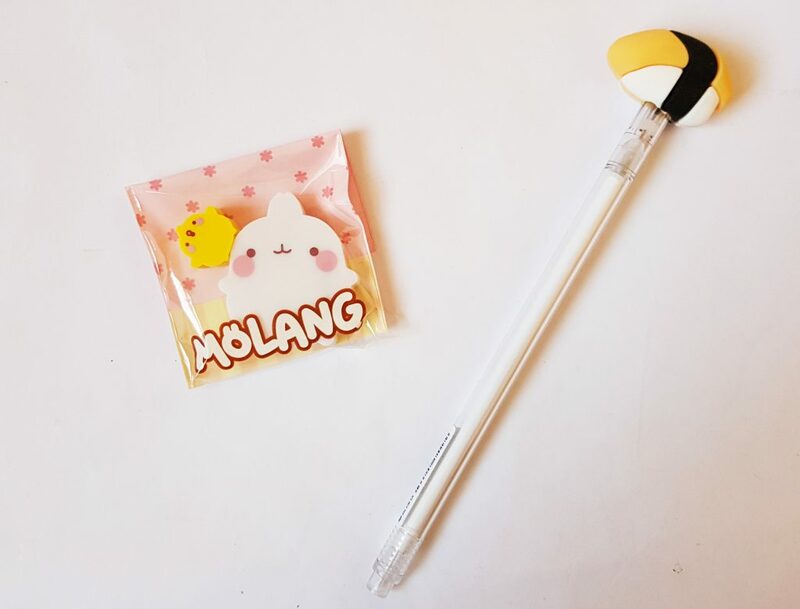 On the left is a Molang Eraser. Molang is a popular South Korean character, and her pal PuiPui the chick. There are way too cute to use! Right is a Shushi Pen. Because why not? Sushi is delicious! 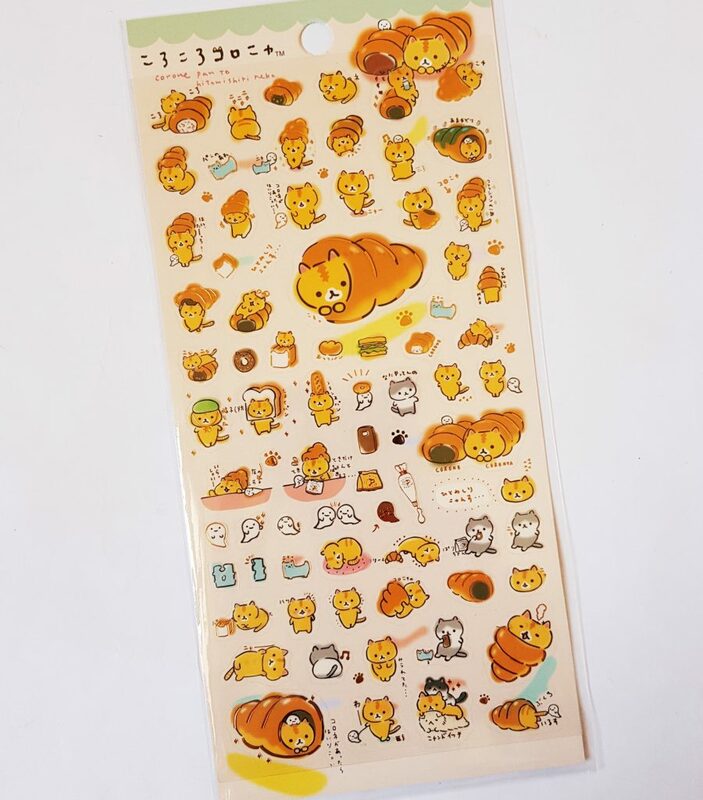 More stationery, a Kawaii Neko Letter Set. 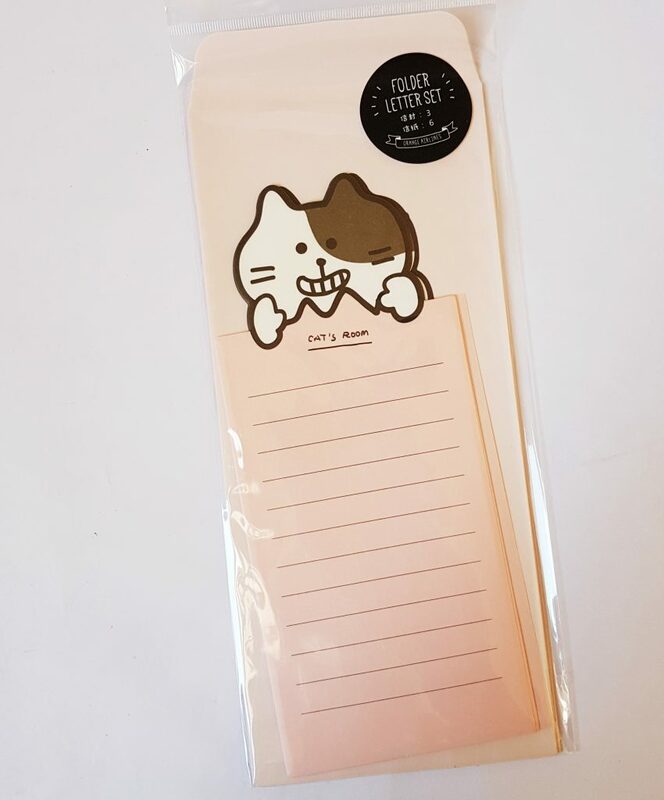 Neko means cat, and this lovely little set of paper and envelopes is perfect for sending notes to loved ones. You can use your sushi pen to write them too! Stickers are lovely, and these feature Corocoro Coronya from San-X. Corocoro Coronya is a little street car who likes to hide inside a bread cone. Really. 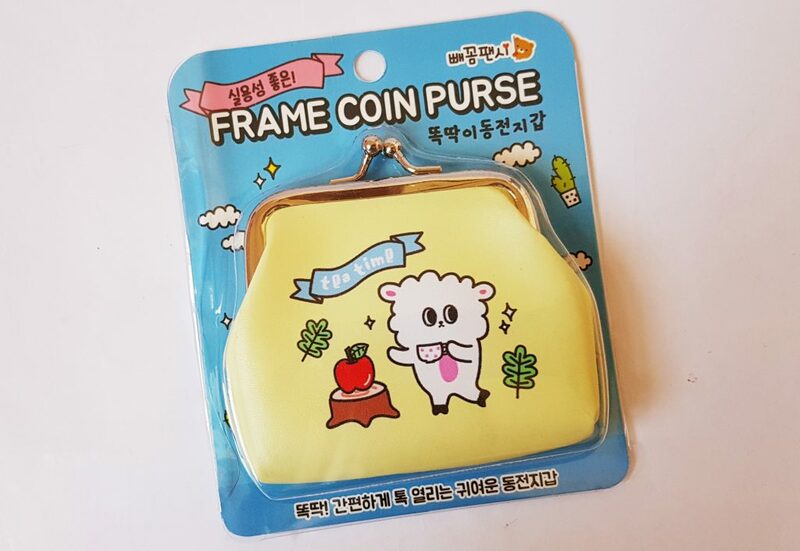 Finally, a Pastel Animals Coin Purse. This is in the Harajuku style, a mix of punk and girly, and very popular with teenage girls. 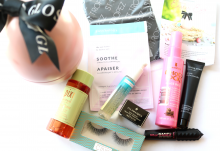 I think this is an adorable box of goodies. It’s a great mix of cute stationery and accessories, plus even a little something to eat. It’s lovely to have lots of things that are both cute and useful, as you can never have too many pens and notebooks, and I love the letter set. We should send more letters! I’m also pretty impressed with the standard of items. For around £15 this is great value. 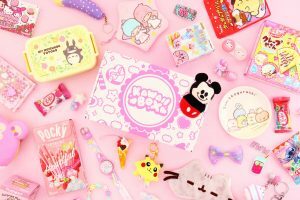 There are two Sanrio items, which are definitely premium kawaii, and they’re pretty expensive in the UK. There are also things you wouldn’t be able to find in the UK at all, so it’s always great to get goodies that are unusual. This is a terrific and affordable way to get your hands on some real Japanese-style cuteness, and you can use everything to add a bit of kawaii in your life!